In the great post-flight frenzy that engulfed Charles A. Lindbergh in 1927, there was an insatiable demand for every bit of minutiae that could be conjured up about the man. 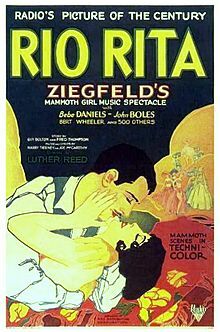 One of the factoids that entered the lore more or less immediately had to do with the smash 1927 Broadway hit Rio Rita, a “mammoth girl music spectacle” produced by the legendary Florenz Ziegfield. Lindbergh had been in New York for more than a week getting ready for the right moment to take off on the flight, and had already started to attract a lot of attention, with his every move noted by swarms of reporters. On the evening of May 19, 1927, some of Lindbergh’s new “handlers” planned to take the “bashful” aviator into Times Square to see the show, and — it was hoped– get some pictures of him surrounded by some “Ziegfield girls.” But at the last minute the party received news of a break in the weather, and Lindbergh cut off the plan and headed back to his hotel to get some sleep (which, however, he did not manage to get). The next morning, he did indeed climb into the cockpit of his plane, and the rest is history. 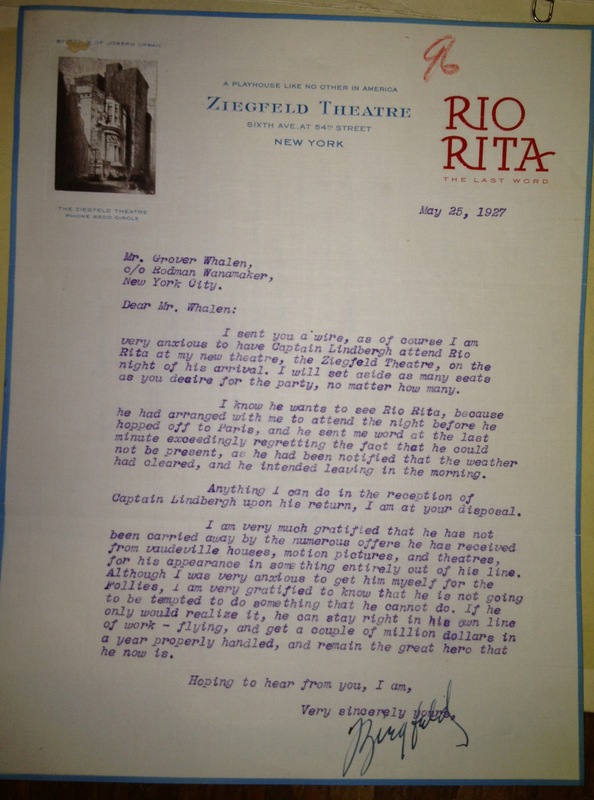 I know he wants to see Rio Rita, because he had arranged with me to attend the night before he hopped off to Paris, and he sent me word at the last minute exceedingly regretting the fact that he could not be present, as he had been notified that the weather had cleared, and he intended leaving in the morning. For the record, Rio Rita was a predictably silly romantic comedy, with an exotic locale (the Rio Grande), Mexican bandits, and mistaken identities. It was a huge hit, and was made (by Ziegfield himself) into one of the earliest and most lavish talking (and singing and dancing) pictures in 1929 by RKO. It was the studio’s biggest hit until King Kong came out in 1933. Here’s a lengthy clip from the 1929 movie, parts of which were filmed in Technicolor.